Perched magnificently upon a granite hill, the bold, striking architecture of Alila Fort Bishangarh appears seamlessly sculpted from the surrounding rustic terrain, overlooking 360-degree views of the impressive Rajasthani landscape. 52 m2 / 562 sq.ft. 75 m2 / 800 sq.ft. Stay for 3 nights or more and enjoy 20% savings on your stay. Rate includes daily breakfast, Wi-Fi internet access, access to gym and more. Booking in advance to enjoy savings on your stay. Rate includes daily breakfast, Wi-Fi Internet access, access to Alila Gym and more. Stay for 2 nights & more to enjoy uniquely majestic setting of Alila Fort Bishangarh in Rajasthan and immerse with food, drinks ,spa , jaipur airport transfers and lot's of fun in an indulgent holiday experience. 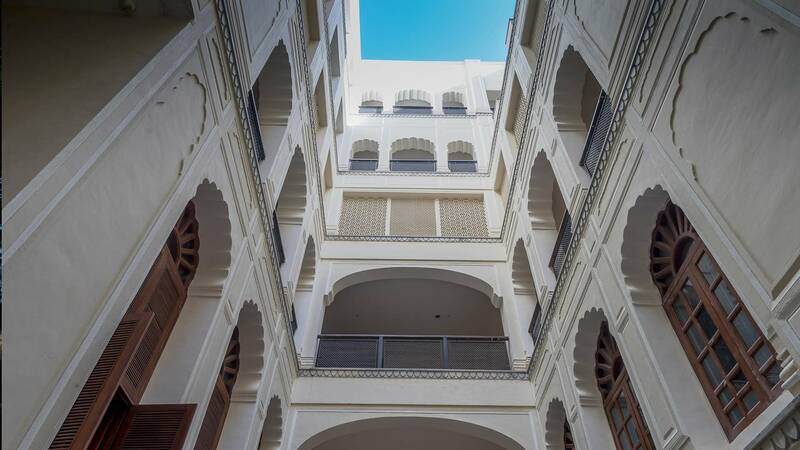 Perhaps the only warrior fort to be converted into a heritage resort, this historic landmark is a unique example of Jaipur Gharana architecture, influenced by both the Mughals and the British. Explore the 230-year fort on the warrior's horse and relive the royal days of the Shekhawati dynasty. Indulge with your loved one in a rejuvenating and relaxing full body spa treatment of your choice, followed by a curated bath experience with a bottle of Prosecco to toast to your happiness! Experience the local life, culture and craft traditions of Bishangarh on this fascinating tour to the Narsimha Maharaj Temple, village streets to meet the local artisans, weavers, potters and other craftsmen. Master your skill in preparing home-cooked Rajasthani meal over a Masterclass with Chef. Witness the unique style and exquisite workmanship of handmade jewellery and carpet weaving of Rajasthan, the craft paradise. In the style of Shahpura royalty, Alila Fort Bishangarh provides a majestic locale for grand meetings and celebratory events. Live the dream of a fairytale wedding amid the sublime splendour and romance of Alila Fort Bishangarh. Savour dishes inspired by the Silk Route at our specialty restaurant, with options to suit all palates. Our open-air dining terrace offers a feast of Rajput hunter cuisine cooked in sand pits and over open flames, served up with spectacular views. Small indulgences that flirt with your palate, new age-inspired Indian tapas, and a cigar and cognac lounge are among the delights of our Petite Luxe Bar. Enjoy charming beverage rituals in the relaxing ambience of the courtyard, including the finest teas, coffees, and champagnes. Our boutique poolside restaurant offers a taste of the Mediterranean using fresh, seasonal, local ingredients and pickings from our organic garden. It also offers a special daily changing dessert menu. A variety of indulgent and rejuvenating spa treatments are combined with personal consultations given by friendly and intuitive spa hosts. The spa also offers a range of yoga classes for guests who seek to invigorate their spirit, along with a variety of self-care recommendations to maintain a balanced sense of well-being. 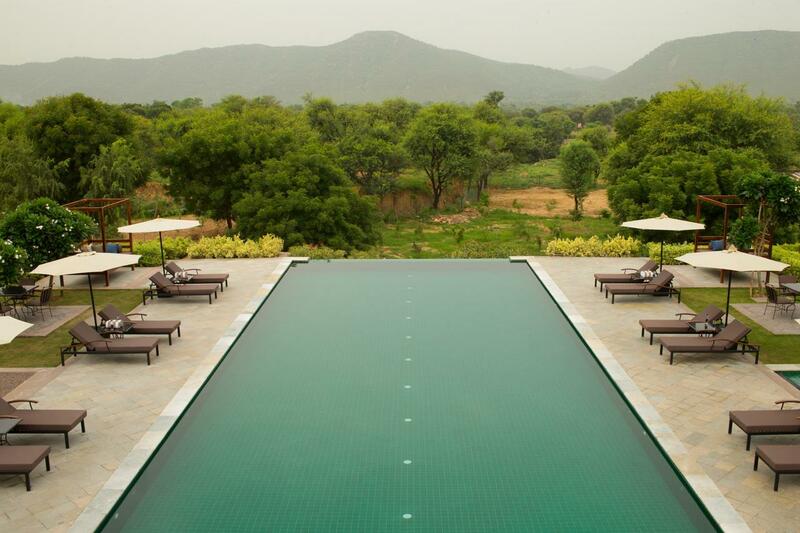 Committed to a sustainable future, Alila Fort Bishangarh is designed in harmony with the environment, preserving the extraordinary natural beauty of the region.